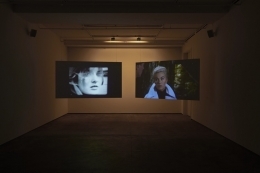 Sean Kelly announces A Point Beyond the Tree, an exhibition by Slater Bradley that comprises new photographic works and a two-channel video installation. 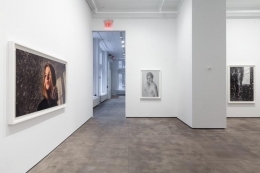 The photographs in the exhibition belong to a series of intimate portraits of Alina, Bradley’s muse over a two-year period beginning in 2011, in which she is presented as his idealized woman. The images in A Point Beyond the Tree mark the culmination of that series. 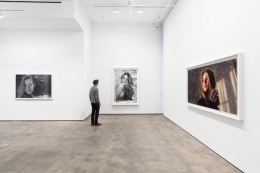 The works are manipulated, either dusted in palladium leaf or blocked out with marker, concealing any possible identifying references from the background, positioning the work outside a specific time or place. 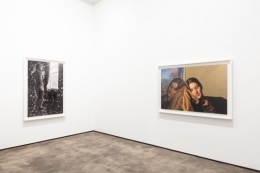 These labor-intensive works require Bradley to spend a great deal of time modifying the imagery, thence reconnecting himself to the original fleeting moment captured in the photograph. 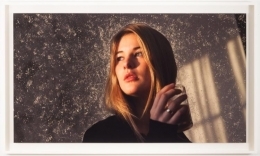 For Bradley, the images suggest themes of longing, loss and unconditional love. Alina is also featured in Sequoia, a two-channel video that will be installed in the lower gallery. The film includes footage from Chris Marker’s La Jetée, the 1962 French science fiction film, Alfred Hitchcock’s Vertigo from 1958, and Bradley’s 2013 homage to the Marker film, she was my la jetée. In Sequoia, Bradley builds on a series of references, isolating a dialogue in Marker’s film that is based on a scene in Vertigo in which the two main characters look at a display of the cross section of a sequoia tree, whose rings are used as a historical timeline. In Marker’s film, the protagonist has traveled back through time to seek out the woman with whom he has become obsessed, explaining to her that he comes from “a point beyond the tree”. 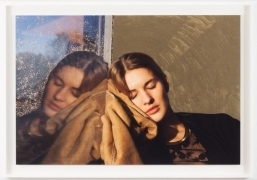 The mirrored sequences from the two iconic films are interwoven with footage of Bradley’s muse – his la jetée – shot in super 8 to suggest a timeless quality. Bradley employs a freeze frame technique in replaying both his footage and the Vertigo sequence to closely mimic the still photographs of Marker’s film, further conflating the individual films and underscoring his interest in blurring the boundaries between photography and the moving image. 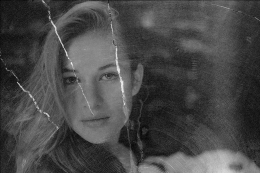 Using experiences unfolding in the present day of his own life, Bradley explores the universal narrative of lost love through his photographic and video works. A Point Beyond the Tree presents a focused view on these deeply personal reflections. Slater Bradley’s work is in the permanent collection of numerous institutions, including: the Solomon R. Guggenheim Museum, New York; the Museum of Modern Art, New York; the Los Angeles County Museum of Art; the Whitney Museum of American Art, New York; the UBS Collection, Zurich, Switzerland; and the Jumex Collection, Mexico City, Mexico. 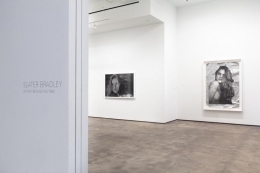 Currently, Bradley is the subject of a solo exhibition on view through December 22nd, at the Johnson Museum of Art, Cornell University, Ithaca, New York. His video, Female Gargoyle, is part of a group exhibition, City of Disappearances, on view through December 14th at the CCA Wattis Institute for Contemporary Arts, San Francisco. "Slater Bradley, A Point Beyond the Tree at Sean Kelly"
Collector Daily, January 10, 2014. “Slater Bradley, To The Point,” Interview, December 2013. “Live Souls,” Modern Painters, March 2010. “Slater Bradley, Boulevard of Broken Dreams,” Art Review, September 7, 2009. “We Care A Lot,” Art Review, June 25, 2009. “Slater Bradley: Perfect Empathy,” Eyemazing, Summer 2009. “Man in the Mirror,” Art Review, December 2007. “Slater Bradley,” The New York Times, December 8, 2006. 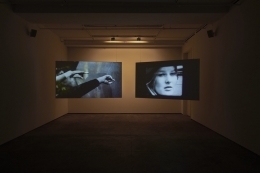 “Slater Bradley At Team Gallery, New York,” Saatchi Online Magazine, December 6, 2006. “Fanciful to Figurative to Wryly Inscrutable,” The New York Times, July 8, 2005. “New York Critics’ Pick: Slater Bradley,” Artforum, February 2003. “Slater Bradley ‘Unknown Pleasures’,” The New York Times, May 17, 2002.